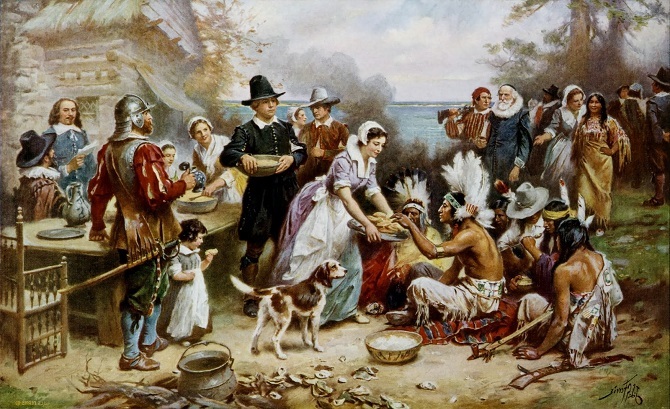 In this charming but completely unrealistic picture, Priscilla Mullins offers turkey to Squanto at the first Thanksgiving. I am one of over probably a million Americans directly descended from Priscilla Mullins and her husband, John Alden, the handsome Pilgrim in black behind her. Thanksgiving is my favorite holiday, and I used to love preparing a big meal for the family, with all the trimmings. These days, not so much. During our navy years, Brett was usually deployed on Thanksgiving, and when he was away our son and I would often join friends at the enlisted dining facility on base. For just $2.65 each we could enjoy an amazing turkey dinner with all the trimmings, as well as several types of desserts (navy cooks are incredible, BTW). The only downside was there were no leftovers. After Brett retired from the navy I fixed a big Thanksgiving meal every year, usually making three types of pie. Sometimes our celebration was just our family, but other years we gathered with and shared our meal with friends. I haven’t made a home-cooked Thanksgiving meal since we arrived here in Hawai’i. For one thing, it’s been too warm here (for me) to roast a turkey, let along makes all the sides. And, these days since it’s just Brett, YaYu and me, a whole turkey seems just too much (especially since YaYu isn’t all that crazy about turkey). The past couple of years we’ve gone out to a local restaurant for dinner, but Brett and I decided against it this year because we’re saving for the Big Adventure. Instead, I’m putting together a “cheater” dinner, courtesy of Costco. We bought a roasted turkey breast as well as mashed potatoes, turkey gravy, and cranberry-sausage stuffing from Costco’s deli section. We tried all of these items a few years ago when we spent Thanksgiving in a cottage down at the Oregon coast, and they were very good. All I will have to do this year is slice and heat the turkey, and heat the potatoes and stuffing in the microwave. The gravy will be warmed on top of the stove, and the only thing that will go into the oven will be asparagus for roasting. Our meal won’t exactly be “home cooked,” but it will be tasty, and provide us with leftovers for a few days. YaYu doesn’t care for pumpkin pie, and Brett and I don’t need it, so we asked YaYu what she’d like for dessert this year and she chose cookies & cream ice cream. We found cookies & cream mochi ice cream balls at the store last week (! ), so will surprise her with that – two of her favorite things in one. We’ll fill out the holiday with a family hike/run to the Pineapple Dump before we eat and the traditional viewing of The Descendants in the evening. Both WenYu and Meiling will be having Thanksgiving dinner with their boyfriends’ families, but will call us in the afternoon. We’ll be buying cucumbers, tomatoes, ginger, bok choy, papayas and rambutan from the farmers’ market this week. Citrus fruit has been showing up – maybe we’ll find tangelos! I’m excited for Thanksgiving as well. I’m making a turkey breast (first time trying that), plus mashed potatoes & stuffing, with cranberry sauce. Should be fun. Before I say anything else, I want to say thank you for the great post on airline mileage and travel hacks – I learned a couple of new things! I tried to comment, but apparently now that I have my own domain I can’t on Blogger unless the Name/URL option is available (I don’t use my Google account for commenting). Anyway, wishing you and yours a VERY happy and blessed Thanksgiving. Your meal sounds wonderful! Your plan sounds wonderful. Happy Thanksgiving to you from Canada (ours was in October)! Thanks, Natalie! I always forget that Canada’s Thanksgiving is a full month before ours. It all sounds delicious! We are hosting Thanksgiving for 8 and I refuse to deal with the whole thaw and cook turkey thing so we bought a cooked one from Whole Foods along with gravy. It says to heat it in the oven before slicing which disappoints me as I wanted to slice and microwave but we will see how it goes. We bought our Thanksgiving meal one year from Whole Foods because we were going out of town the next day – it was very good (although I don’t remember anything about heating the turkey). Same to you! Hope you have a wonderful and relaxing day.